For the now-abandoned mammal taxon, see Insectivora. "Spider eater" redirects here. For the fictional monster, see Spider eater (Dungeons & Dragons). This aardwolf skull exhibits greatly reduced molars and carnassials teeth as they are unnecessary for any large, insectivorous animal subsisting on soft insects such as termites. 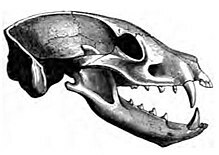 The dentition of a shrew is very different. The aardwolf uses its canine teeth in self-defence and, occasionally, in digging; accordingly, the canines have not been greatly reduced. An insectivore is a carnivorous plant or animal that eats insects. An alternative term is entomophage, which also refers to the human practice of eating insects. The first insectivorous vertebrates were amphibians. When they evolved 400 million years ago, the first amphibians were piscivores, with numerous sharp conical teeth, much like a modern crocodile. The same tooth arrangement is however also suited for eating animals with exoskeletons, thus the ability to eat insects is an extension of piscivory. At one time, insectivorous mammals were scientifically classified in an order called Insectivora. This order is now abandoned, as not all insectivorous mammals are closely related. Most of the Insectivora taxa have been reclassified; those that have not yet been reclassified remain in the order Eulipotyphla. Although individually small, insects exist in enormous numbers – they number over a million described species:1958 and some of those species occur in enormous numbers. Accordingly, insects make up a very large part of the animal biomass in almost all non-marine, non-polar environments. It has been estimated that the global insect biomass is in the region of 1012 kg with an estimated population of 1018 organisms. :13 Many creatures depend on insects as their primary diet, and many that do not (and are thus not technically insectivores) nevertheless use insects as a protein supplement, particularly when they are breeding. Examples of insectivores include different kinds of species of carp, opossum, frogs, lizards (e.g. chameleons, geckos), nightingales, swallows, echidnas, numbats, anteaters, armadillos, aardvarks, pangolins, aardwolfs, bats, and spiders. Even large mammals are recorded as eating insects; the sloth bear is perhaps the largest insectivore. Insects also can be insectivores; examples are dragonflies, hornets, ladybugs, robber flies, and praying mantises. :31 Insectivory also features to various degrees amongst primates, such as marmosets, tamarins, tarsiers, galagos and aye-aye. :56–57 There is some suggestion that the earliest primates were nocturnal, arboreal insectivores. Drosera capensis, the Cape sundew, bends on trapping an insect. Insectivorous plants include the Venus flytrap, several types of pitcher plants, butterworts, sundews, bladderworts, the waterwheel plant, brocchinia and many members of the Bromeliaceae. The list is far from complete, and some plants, such as Roridula species, exploit the prey organisms mainly in a mutualistic relationship with other creatures, such as resident organisms that contribute to the digestion of prey. In particular animal prey organisms supply carnivorous plants with nitrogen, but they also are important sources of various other soluble minerals, such as potassium and trace elements that are in short supply in environments where the plants flourish. This gives them a decisive advantage over other plants, whereas in nutrient-rich soils they tend to be out-competed by plants adapted to aggressive growth where nutrient supplies are not the major constraints. Technically these plants are not strictly insectivorous, as they consume any animal that they can secure and consume; the distinction is trivial, however, because not many primarily insectivorous organisms exclusively consume insects. Most of those that do have such a restrictive diet, such as certain parasitoids and hunting wasps, are specialised to exploit particular species, not insects in general. Indeed, much as large mantids and spiders will do, the larger varieties of pitcher plant have been known to consume vertebrates such as small rodents and lizards. :13 Charles Darwin wrote the first well-known treatise on carnivorous plants in 1875. ^ Miller, George A. (2009). ""WordNet – About Us." : entry on insectivorous". Princeton University. Retrieved 1 April 2010. ^ Gullan, P. J.; Cranston, P. S. (2005). The Insects: An Outline of Entomology. Malden: Blackwell Publishing. p. 455. ISBN 978-1-4051-1113-3. ^ Capinera, John L. (Editor). (2008). Encyclopedia of Entomology, (2nd ed). Springer Reference. ISBN 1-4020-6242-7, ISBN 978-1-4020-6242-1. Ltd preview in Google Books. Accessed on 1 Apr 2010. ^ Dudley, Robert (2002). "Flight and the Pterygote Insecta". The biomechanics of insect flight: form, function, evolution. Princeton University Press. pp. 3–35. ISBN 978-0-691-09491-5. ^ a b Whitney, Stephen R.; Sandelin, R. (2004). Field Guide to the Cascades & Olympics. The Mountaineers Books. p. 317. ISBN 978-0-89886-808-1. Retrieved 2010-04-01. ^ ""Long-beaked Echidna (Zaglossus bruijni)" (entry)". animalinfo.org. West of Scotland & Ayr Group. Retrieved 1 April 2010. ^ Holekamp, Kay E. "Aardwolf (Proteles cristata)". www.animalinfo.org. Archived from the original on 17 April 2010. Retrieved 1 April 2010. ^ Hill, Dennis S. (1997). The economic importance of insects. Springer. p. 198. ISBN 978-0-412-49800-8. Retrieved 2010-04-01. ^ Stetoff, Rebecca (2006). The Primate Order. Marshall Cavendish. p. 92. ISBN 978-0-7614-1816-0. ^ a b c d Slack, Adrian; Gate, Jane (2000). Carnivorous Plants. MIT Press. p. 240. ISBN 978-0-262-69089-8. ^ Darwin, C. (1875). Insectivorous plants. London: John Murray. Archived from the original on 2006-09-23.